Hailling from Merill WI and guiding on many waters in North and Northcentral Wisconsin, is Todd Schulz. He enjoys and takes pride of out teaching people how to fish for Muskies and teaching them the skills that will help them become better anglers! 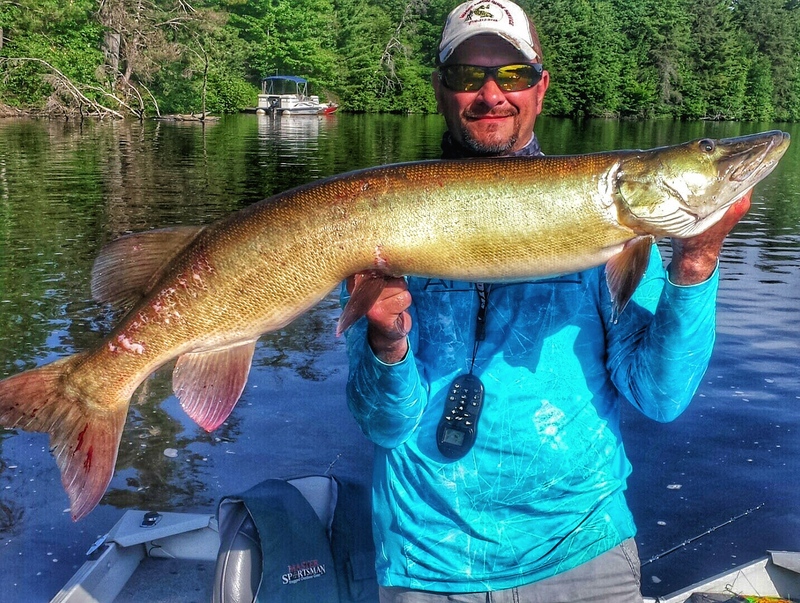 He owns a lure business called ”Shhwack’em Musky lures” and is a pro staff member of Super Slayer Tackle Co. As we all known fishing for any Esox, whether it be Muskie or Pike, can be very difficult in Summer, but Todd has found it’s own way of approaching things, and below you can read how! During the “Dog Days” of Summer I tend to do some things different than others, once August hits I tend to mix things up a bit on the water. As a Guide, most of the time, I do not get to pick and choose the times my clients want to hit the water, certain times of day can make it difficult because of algae blooms, water temps, and flat calm days. There are a few things that I do that may help you be more successful on the water. Try to fish early mornings or evenings. When the August heat cranks up and the water temps are almost, if not pushing 80 degrees, it is time to plan your trip early or late in the day. By fishing at these times not only will it cause less stress on you from the heat, but it also causes less stress on the Muskies during the catch and release. 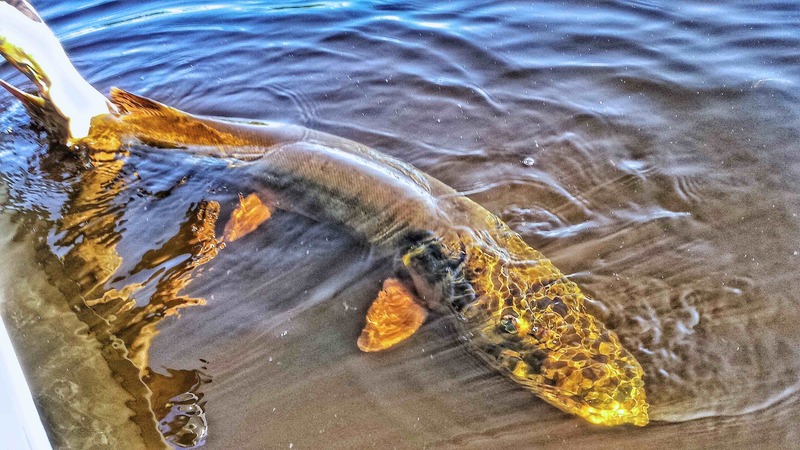 At this time of the season Muskies have established definite home ranges and most likely never leave them throughout this entire period of the season. With that said, if you are having success on mid lake humps and weed edges as the day goes on those fish will not go far. As the sun heats up the shallow water Muskies will move to deeper water. Hard work pays off! The author with a nice Muskie. Fishing lakes with heavy algae blooms can complicate things a bit. No matter what Muskies will have to eat but the most challenging part of “the bloom” is seeing Muskies follow your lure to the boat. If some of the lakes I fish have a heavy bloom I tend to fish rivers and their flowages, because they are less likely to have much of an algae bloom due to current. Sometimes we do not have a choice so fishing lakes with “the bloom” must be fished in a slightly different approach. Big blades and obnoxious color is a must. 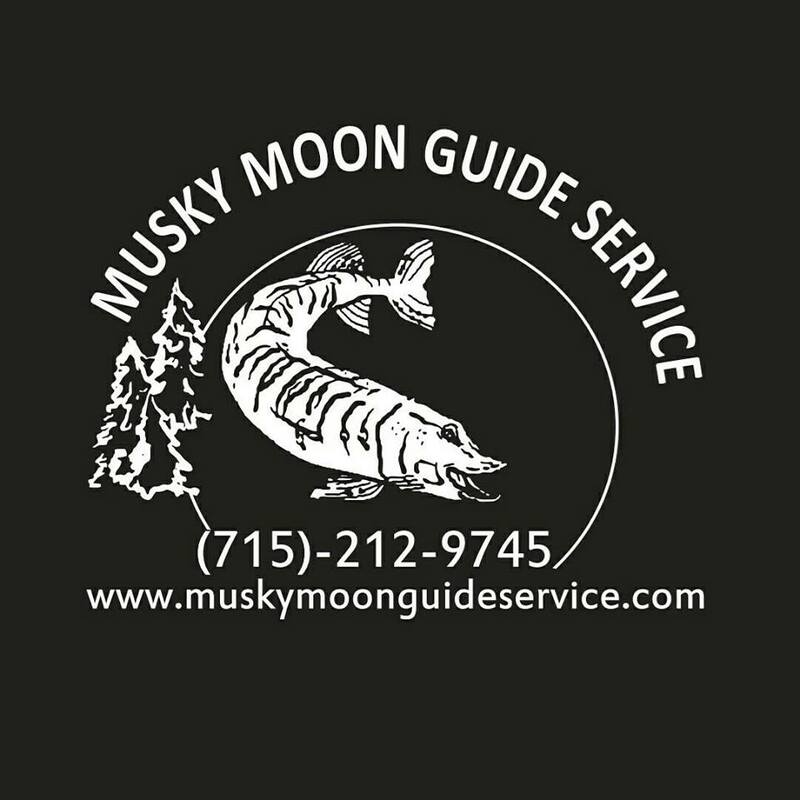 Not only is it tough for us to see our lures, or a following Musky, but Muskies also have a tough time seeing lures and their pray. They rely on their sense of sound and vibration which triggers their lateral line. The previous three sentences lead me into my lures of choice. Prop style top waters, in-line spinners, gliders/jerk, and soft plastic/big rubber baits are all a must and you should fish them throughout the day. For example, in my boat if I have three of us pounding the water the person in front is most likely throwing some type of blades, the middle person should throw top water, and I am in the back of the boat working gliders, jerk baits, or big rubber! 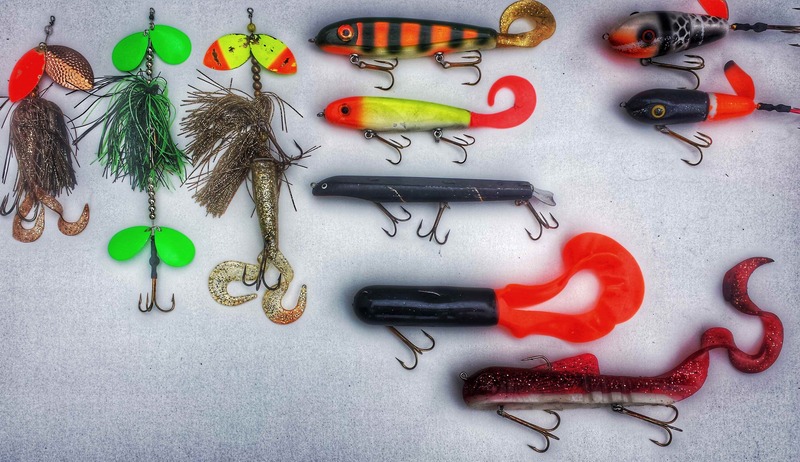 Todd’s lure arsenal for Dog Days Muskie Hunting! Now that you see my routine these are the lures I never hit the water without during the dog days of summer: Prop style top water lures- small prop if I have a dead calm body of water, medium to large prop depending on the chop on the water. You will have to see what works best for you on the body of water you are fishing. For instance, we have boated many Muskies on flat water conditions with big prop top waters. Trust me the fish will let you know what they prefer. Blades- 7,8, and 10’s work wonders at high rates of speed. Not only does it let you cover water, but Muskies are in full swing, and most likely will not hesitate to chase and eat your in-spinners at hyper speed. Gliders & Jerk baits- these work wonders for us throughout the season. Not only are they great search baits but most of the time they cannot resist them. Work them at a moderate tempo or pull. My approach with these types of lures is simple; “pump, pump, pump, pause” then repeat. They normally get crushed on the pause. Only let them pause for a count of 1:1000. Soft Plastic & Big Rubber lures are great starting in August. Pumped out of the weeds on one of his home-made lures! Sometimes bigger is better but not always. To find out what they prefer I tend to start out on the larger side when working on my Musky hot spots. If I have not sparked any interests after a while I down size to see if that sparks a strike. My approach to these types of lures is long pulls and BIG rips. I have found this to the best approach to working these lures. They tend to get eaten as the lure descends and as you are reeling in your slack line for the next rip. 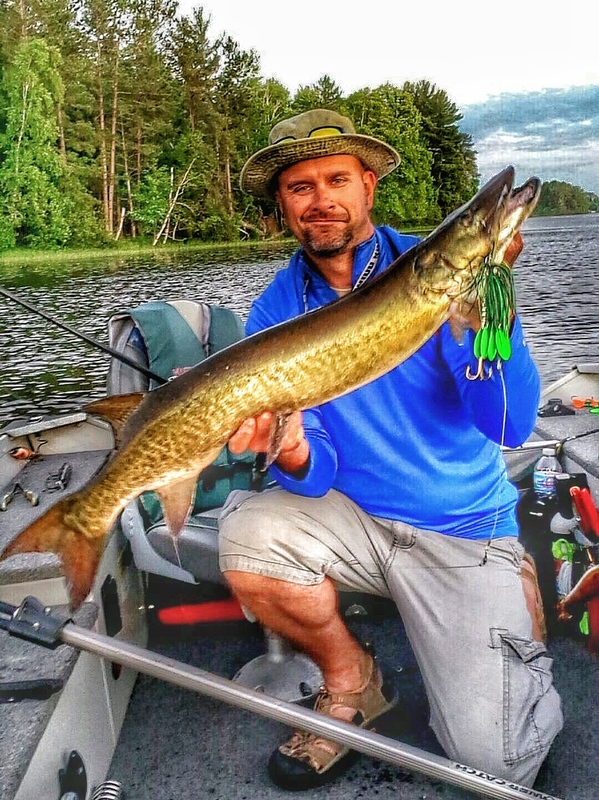 Do not be surprised if you connect with a Musky on a rip or a pull, so in other words stay focused! I hope this article helps you through the dog days of summer and you catch that fish of a lifetime. Remember to practice C.P.R. (catch, photo, release) so you or someone else gets the opportunity to catch that fish again. Good luck on the water!